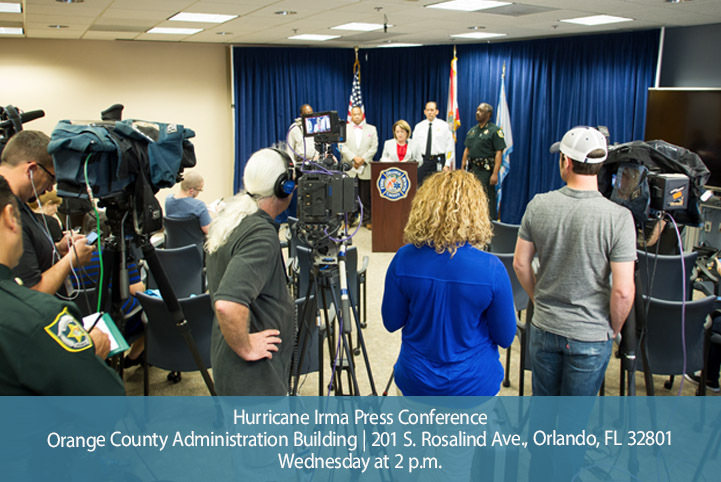 Orange County, Fla. – Orange County Mayor Teresa Jacobs will host a 2 p.m. press briefing at Orange County administrative headquarters located at 201 South Rosalind Ave., Orlando, in room 105. Orange County will begin distributing sandbags today, from 3 -7 p.m. at specific Public Works facilities. Sandbag distribution will take place again on Thursday and Friday from 7 a.m.-7 p.m. while supplies last. Due to high demand, Orange County residents will need to present proof of residency. Residents may collect up to 10 sandbags per vehicle. For sandbag distribution locations, please visit www.ocfl.net/sandbags. For information on Hurricane Irma, visit www.ocfl.net/Irma. Orange County Government is encouraging residents to prepare for Hurricane Irma and continues to monitor and assess updates from the National Hurricane Center. Orange County currently has 45,000 pre-filled sandbags and expects to distribute more than 70,000 to residents. Orange County Government remains open for business and advises residents to ready their hurricane preparedness supply kit. For storm preparedness information, please visit www.ocfl.net/storm. Orange County has several tools that are available to residents during a tropical weather system. Download Orange County’s news and information apps free on Apple and Android devices, to receive emergency management communications and to stay informed before, during and after a storm, www.ocfl.net/apps.